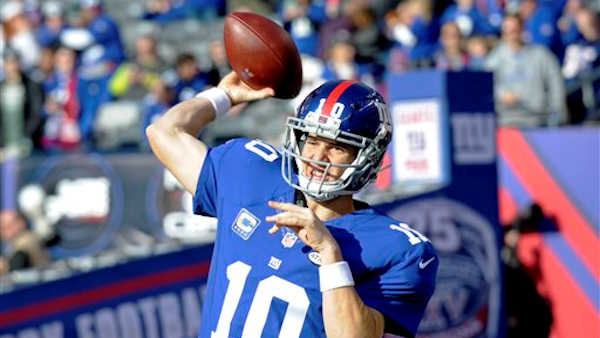 MIAMI, Fla. -- The New York Giants rank last in the NFL in pass defense, which will tempt the Miami Dolphins to revert to their old ways Monday night. After the Dolphins threw 58 times two weeks ago, they fired their offensive coordinator and passed only 19 times in last week's win over Baltimore. But Miami's newfound devotion to the ground game will be tested against New York. While both teams are 5-7, only the Giants are in playoff contention. They're third in the NFC East, but only one-half game behind the Redskins and Eagles, who both won Sunday, while the Dolphins are last in the AFC East. You can catch the game on ABC7NY starting at 8 p.m. PLAY CALLING: Dolphins interim coach Dan Campbell wants to run first, which thrills his offensive linemen. "We'd rather be going forward than backward," center Mike Pouncey said. Campbell has given Ryan Tannehill more input in preparing the game plan and more latitude to call audibles, but wants to rely less on his quarterback's right arm. Tannehill is 0-5 this year when he throws more than 40 times. "There's a certain way to use Ryan Tannehill, and that's what we're trying to do with him, and set him up to give him the best chance of success possible," Campbell said. Last week, with quarterbacks coach Zac Taylor calling plays for the first time, the Dolphins gained more yards rushing than passing for the first time since the 2014 opener. Lamar Miller ran for 113 yards against the Ravens. But everyone throws a lot against the Giants. They're allowing 321 yards passing per game, have given up more completions than any other team and rank next to last in sacks with 15. The Dolphins' talk about better balance has accomplished one aim: They've got the Giants wondering how often Tannehill will go to the air. "He's switching in and out of coordinators," Giants defensive back Dominique Rodgers-Cromartie said, "so you kind of don't know what kind of game plan you're going to get." RUSHING GIANTS: Like Miami, New York has been a passing team most of the season. The Giants rank 29th in rushing and have only three touchdowns on the ground. In an overtime loss last week to the Jets, the Giants ran the ball 24 times - their highest total since October - but averaged only 3.1 yards. "All we can do is keep working at it and working at it, and not lose patience with it, and understand why it's there in the first place," coach Tom Coughlin said. "Last week we decided regardless that we were going to stay with it. And we did. We ran the ball in all quarters." The Dolphins' previous opponents believed the ground game was the way to beat them. The opposition has run the ball 32 times a game against Miami, the highest average in the league. PLAYOFF CHANCES: When asked about the Giants' frame of mind with a month to go in the playoff chase, the 69-year-old coach Coughlin started doing jumping jacks. Coughlin and the Giants are in surprisingly decent shape despite three consecutive losses. But next Sunday they face NFC South leader Carolina, which magnifies the need to beat Miami. The Dolphins have the same record, but they've been out of the playoff picture since Thanksgiving weekend. "We did that to ourselves," Campbell said. "I don't have a problem if someone puts us in the forgotten category of in the hunt. You've got to earn it to get in it anyway." BECKHAM VERSUS LANDRY: The Giants' Odell Beckham Jr. and Miami's Jarvis Landry will be opponents for the first time since they were teammates at Louisiana State, where they became close friends. Beckham ranks fourth in the league with 1,154 yards receiving, and is tied for second with 10 touchdown catches. "He's 60 percent of their offense," Miami safety Reshad Jones said. "Knowing where he's at is huge." Beckham and Landry have 78 catches apiece. The Giants' secondary is well aware Landry, like Beckham, has a reputation for circus catches. "The good thing we have is we go against and see it so much in practice, you're not at, 'Wow!'" Rodgers-Cromartie said. GREAT PLAYERS: In celebration of the Dolphins' 50th season, fans, alumni and media selected an all-time team, and the 50 players chosen will be introduced at halftime.